Luck. It’s the theme of St. Patrick’s Day, Feng Shui, and of course Frank Sinatra’s “Luck Be A Lady,”. We have all heard of it and most of all we can’t help wanting to feel lucky. Just the word makes you feel hopeful, doesn’t it? Although you may not think about it much, luck is trusted upon every day by people from all over the world. So many people are seeking a big break or a lucky hand, and it can seem discouraging when others seemingly receive all the luck we desire—they win big at casinos, land rewarding deals, have perfect lives, and attract all the best things. The truth is that there is a secret. 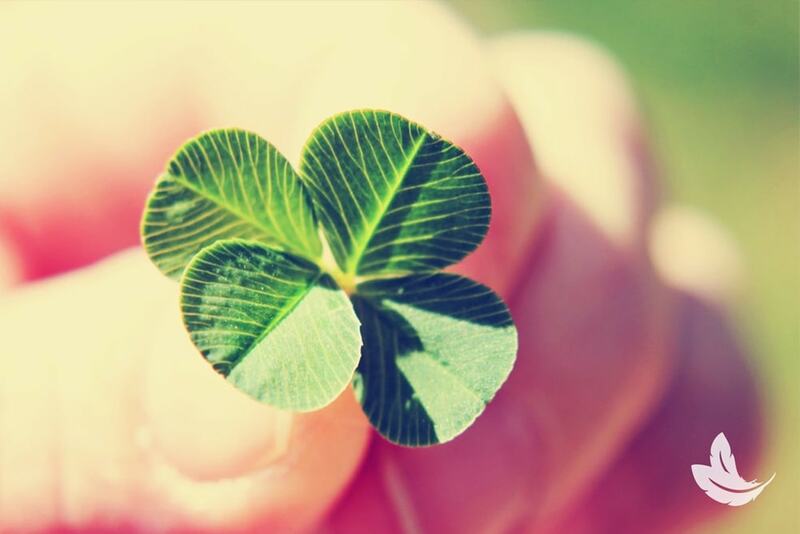 Just like your ability to bring comfort, love, and happiness into your life, you too can create your own luck. Being able to control over how “lucky” you are begins with having confidence in yourself, a strong mindset, and clear goals. Think of yourself as a big magnet. What do you want to attract into your life? Makes you think a moment, doesn’t it? All luck begins with positivity—the more positive you are, the more of life’s fortunes will willingly fall into your lap. Do you ever notice that you feel a strong draw to people that make you happy? Positivity is infectious; it wraps others in warmth, which is the reason why people like Ellen DeGeneres are teeming with fans and followers. The more that you channel your positivity and let it flow, the more people want to be around you, engaging an attraction of similarly positive people. Positivity starts a domino effect, like watching Ellen on TV. You become immersed in the uplifting nature of the show, you tell a friend, they begin to watch, and the next thing you know, all of America is watching. We’re constantly attracted to positive and happy people. You can’t help not to be; it’s a soul connection felt when we meet someone and genuinely like them. You have the ability to be a shining light for others, and for yourself. Think of things you REALLY want in life. Not just small things, I mean everything that you want in the next 5 years. The type of life you desire, your perfect job, how much money you want to make, etc. Even if your dreams seem too distant, let your mind travel there. Sometimes, you need to shut off your inner fears and restrictions and think bigger than what you feel your limits are. When you brainstorm something you’re bringing it to life, so create an all-encompassing vision board. Everything begins as an idea before manifested into reality, and with a vision board, you begin to conceive what you truly want, feeling what it would be like to live that life and own those things. Although it may seem as though you’re simply pasting photographs and words to a board, you’re actually training your mind, body, and soul to gauge how to navigate bringing those aspirations into your life. Do you notice that lucky people tend to radiate warmth and kindness? This is because they do not let their mind wander to negative places. Positive, lucky people tend to find and see positive outcomes while others fixate on obstacles. Select three positive affirmations and repeat them silently to yourself throughout the week—by training your mind to be more positive, you too will see how you can achieve what you want and how you have the ability to make luck enter your life. Surround yourself with positive people. Energy radiates off groups, and the more positivity you keep around you, the luckier you will become. When you come together with like-minded, positive energy, you are creating a bounce of optimism that lifts everyone up. Expect good outcomes, but always remember to stay humble. There’s nothing wrong with wanting happiness and luck to enter your life—as long as your intentions are pure and you’re wanting it for the right reasons. When luck begins to come, share it with others—nobody ever became poor by sharing. Keep a grateful heart and constantly remind yourself how blessed you are. Gratitude is the best attitude. The next time you’re at the casino or feeling like you need a serving of luck, ask luck to enter your life. Tell yourself, “today I am going to win.” Think of what you may do with what you’re provided and how you’ll better the lives of yourself and others with it. Let luck take care of the rest! I like to gamble. I’m always thinking I’m going to win. I know it’s not realistic but I don’t care. I keep thinking that if/when I win big I can make my kids future more secure. I truly enjoy things like keno and the nightly lottery games. I never spend money that would endanger my family. My true luck is my daughter , my son and my two granddaughters. The love of my life is in heaven now. She was and still is my greatest and luckiest gift. You are so inspiring 💚 Thank you. I feel soo lost. No friends, no support. Don’t know how much longer I can go on. I need help. There’s always someone willing to help.Please seek the help you need. There are organizations out there that will help you. Best of luck.